Washington, D.C. His Excellency Abdulaziz Kamilov, Uzbek ambassador to the United States, gave the welcoming remarks at this special dance concert celebrating 2,700 years of the city of Samarkand, Uzbekistan. Presented by Publick Playhouse and performed by the award-winning Silk Road Dance Company, 'The Golden Road to Samarkand,' premiered on November 4, 2006. The new work --directed by Laurel Victoria Gray -- celebrated the varied cultures along the ancient caravan routes while also examining the delicate balance between art and power. More than thirty dancers performed pieces from Uzbek, Persian, Tajik, Azeri, Afghan, Uighur, Turkmen, Indian, and Chinese cultures, portraying the cosmopolitan legacy of Samarkand. Lavish, detailed costumes – many designed by Gray and constructed by members of SRDC – offered a visual reminder of the diversity of peoples who contributed to the development of Samarkand. Russian born artist Evgenia Luzhina- Salazar is the set designer. “This is more than an ethnographic travelogue,” explained Gray who carefully selected traditional pieces as well as creating new choreographies for the concert. “These dances depict the range of human emotion, from love and longing to sorrow and despair.' Gray sees the caravan as a metaphor for the human journey; Samarkand embodies the desire for fame, power, wealth – and beauty, too. 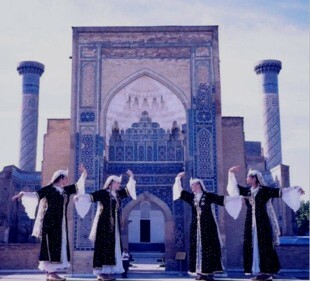 The Golden Road to Samarkand draws inspiration from the Silk Road Dance Company’s trip to the ancient Uzbek city in August of 2005 to perform at the UNESCO sponsored Sharq Taronalari (Melodies of the East) International Festival. The Washington D.C. based company became the first American dance ensemble to earn this invitation. During the Samarkand festival, SRDC became acquainted with leading artists from over 50 countries, marking the revitalization of Samarkand’s role as a major cultural center for the Islamic world. The ensemble gave four performances and became the subject of an Uzbek television special.